If you want to be chosen for an early access, make sure to sign up for it: The Sims 4 Create A Sim Demo: Early Access Signup! As of yesterday, a select group of Simmers has gotten access to the demo. To check if you were among them, go to your Origin account on the Origin client and check if you have access. Some people also got keys through various channels so also check your email and spam folders. EA is rolling out demos in waves. Make sure to check your Origin account and Email from time to time. 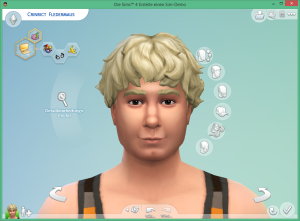 I also got a key and I tried to make a Crinrict Sim I gladly share. I will make a post with more details about all kinds of stuff soon. If you did not get the Demo, don’t be sad, it will be available to everyone later. EA as announced yesterday that there will be a public CAS Dem for everyone. There is no definite date at this point but here is that most important info that is available right now. Please do not fall for any scam sites. The CAS Demo will be exclusively available through Origin. If yo see a demo on another site (especially atm) that is a scam with the only aim to get your account data or give you a virus. Don’t fall for it. You will not need a constant Internet Connection to use it, just to download. The Demo will be completely free. The Demo is not available for Mac. More info to follow once the Demo is actually available.